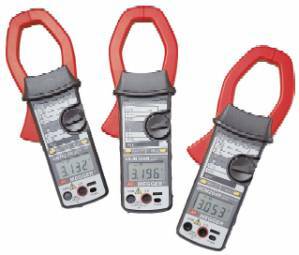 The Megger DCMR Series of digital clampmeters have a 4 digit LCD and are available in different version for maximum currents of 200A, 1000A and 2000A. They feature auto-ranging and auto-zeroing and can measure a.c., d.c., pulsed and mixed currents. Additional functions include the measurements of voltage, resistance, continuity and a diode test. the overall accuracy of 1.3% of the measured value has been achieved by utilizing the largest microprocessor technology, plus the use of a true RMS measuring technique. This accuracy even applies when harmonics or complex waveforms are present.